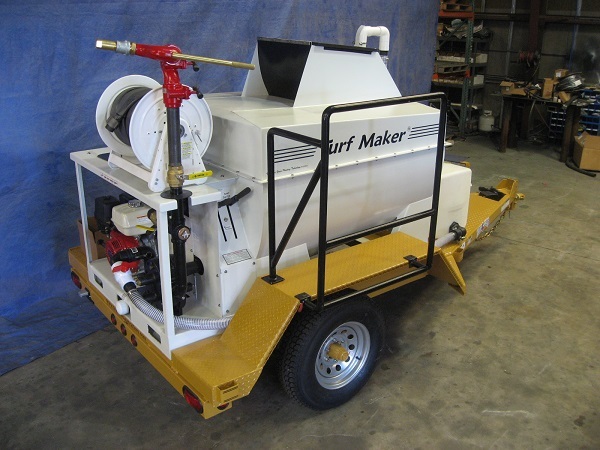 The Turfmaker 390® is a Real Hydroseeding Machine with Mechanical Agitation Priced to Compete and Out Perform Larger Jet Agitated Machines. The TurfMaker 390® Model Hydroseeder, with mechanical agitation, is a cost effective alternative to jet agitation machines. Typically, jet agitation hydroseeders are limited to soupy slurries of paper mulch. Soupy paper mulch applications washout easily and frequently yields spotty seed germination. Poor grass growing results make unhappy customers. The TurfMaker 390® easily mixes and pumps thicker wood mulch slurries associated with Sod Quality Results™ and happy satisfied customers. 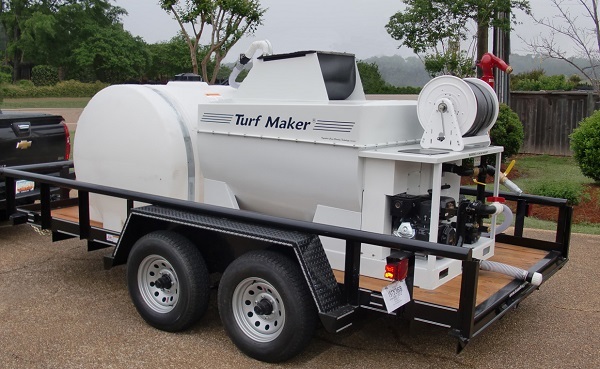 The TurfMaker 390® fully loaded weighs about 4,500 pounds. With a base of 47 inches in width and 77½ inches in length, it is designed to fit easily in the back of a standard bed pick-up truck. Getting in and out of tight areas becomes much quicker and easier when there is no trailer involved to slow things down. 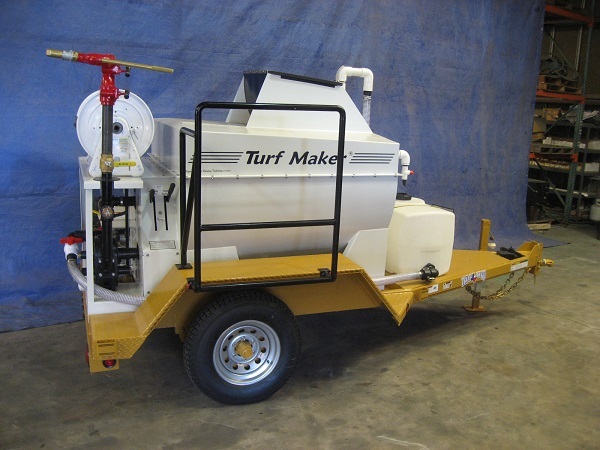 The TurfMaker 390® is a complete 390 gallon hydroseeding machine with mechanical agitation and a positive displacement pump. Normal mulch loading is 125 lbs of 100% wood mulch, 125 lbs of any Bonded Fiber Matrix product or 175 lbs of paper mulch. The base model hydroseeder comes ready to use, equipped with 75 feet of hose and one hose application nozzles. 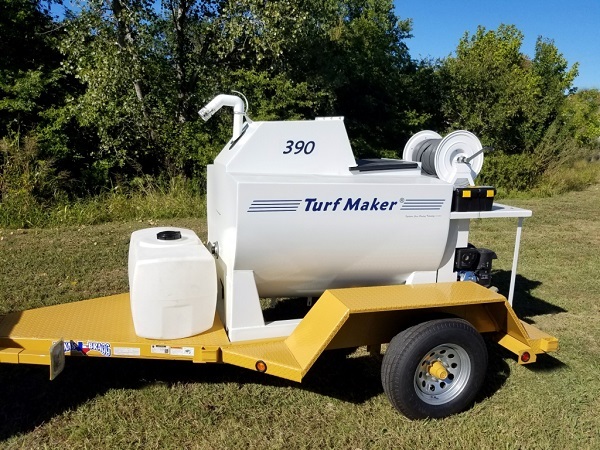 When water is readily available for quick filling, a TurfMaker ® 390 hydroseeder will easily produce three tank loads of application in one hour. When applying quality wood mulch products, along with tackifiers for Sod Quality Results™, three tank loads will cover from 7,000 sq. ft. to 8,000 sq. ft. Jet agitation machines, due to difficulty of loading and clogging, seldom get as much as one tank load per hour, and that tank load is applying soupy paper mulch. 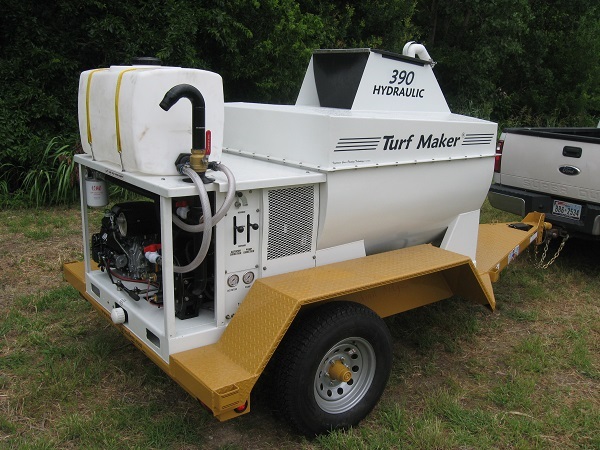 For really small jobs or small touch-ups, a TurfMaker ® 390 hydroseeder will mix partial loads. A 50 lb bag of 100% wood mulch can be mixed with 135 gallons of water and cover about 1,000 sq. ft. A 50 lb bag of any Bonded Fiber Matrix product can be loaded with 125 gallons of water and cover about 500 sq. ft. A 40 lb bag of paper mulch can be mixed with 80 gallons of water and cover up to 3,000 sq. ft. 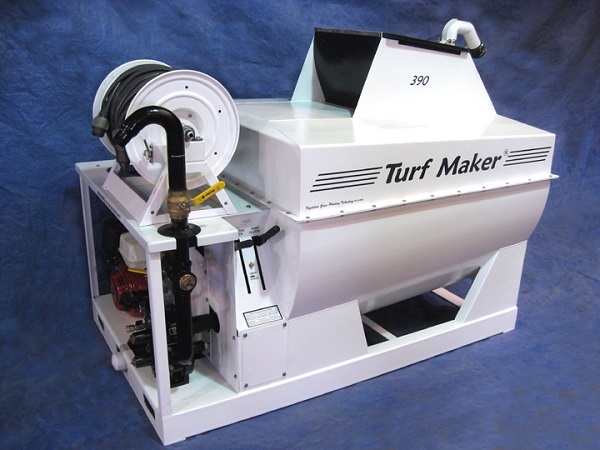 The TurfMaker ® Model 390 hydroseeder, with mechanical agitation is by far the best choice, even when the buyer is faced with a limited budget. The TurfMaker® 390 will mix and pump the thickest mulch slurries, such as Flexterra®, Soil Guard, and all other BFM type products, up to 150 pounds per tank load through at least 150 feet of hose, with a KOHLER CH440 14hp engine. For long distance hose applications up to 300′, use a KOHLER CH620 19hp engine. For greater than 300′ hose applications, up to a KOHLER CH1000 37hp engine. Standard Engine: Kohler CH 440. Other Engines Available. Note: Long distance applications depend on larger engines to get the most distance from the end of the nozzle. ** Blended mulches can be loaded more or less depending upon brand and density.